I finished 2 of the 3 quilts that I need to finish this week. I love, love, love quilting feathers!! 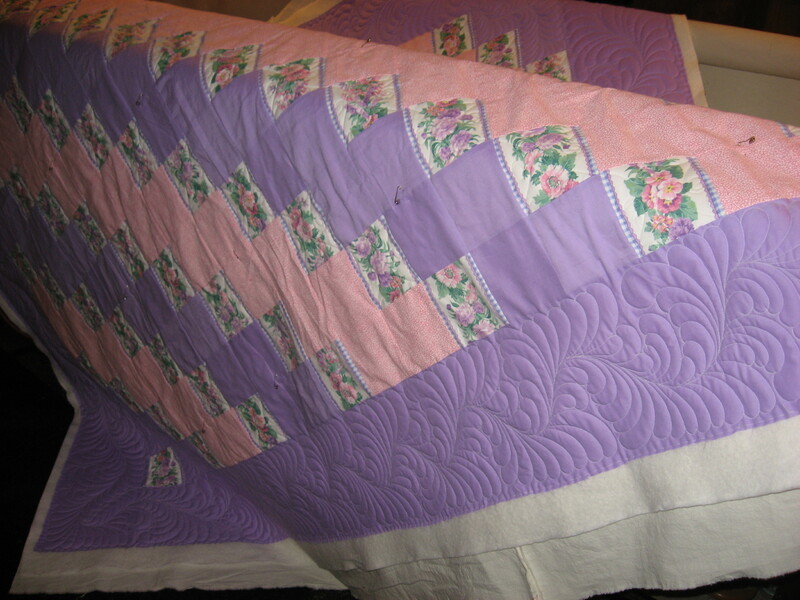 I have been dying to quilt this quilt since the day I got it. I knew when I saw it that I would quilt feathers on it. 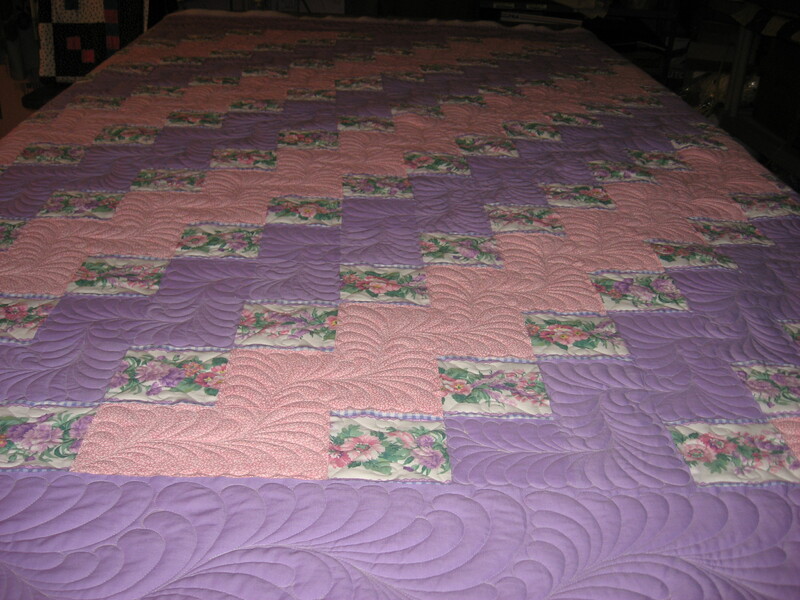 Because of the diagonal pattern, I quilted the floral squares with a continuos curve pattern and then quilted the border before taking the quilt off the machine and reloading it sideways. The quilting went really fast that way. After I took this one off, I loaded a small baby quilt and did a panto pattern on it. 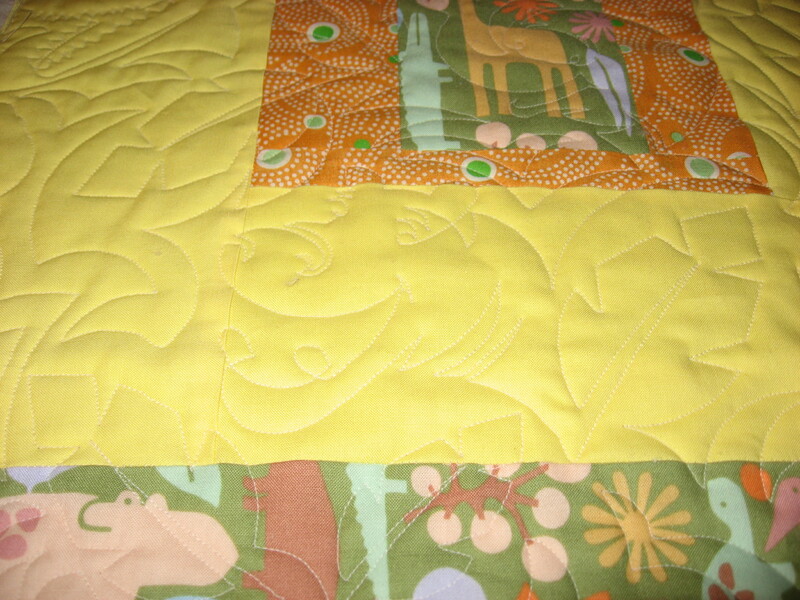 The fabric has jungle animals on it, so I used a cute pattern with animals on it. Can you see the alligators face? I even had time to sew on my BOM. All the blocks are sewn into rows, ready to be sewn together. Hopefully I can get the rows sewn today and be ready to add the borders. I have the next quilt on the machine, which is the same BOM pattern as I’m sewing on, except it’s in blue and mine’s in red. Guess I better get back to work here. Have a good day!! I love your feathers. I’m fairly new at longarming so I haven’t learned to do them yet. What advice do you have for me? A certain book, DVD or class maybe? Also, what kind of longarm do you have? I always have quilts on my mind too. Thanks Jan. I’ve been longarmimg for a long time so I’ve done lots of feathers. They’ve changed over the years!! I look back on my first ones and think “Oh my! Those are bad!! LOL! !” Anyway, there are many ways to make feathers and lots of books and videos on them. Youtube has lots of videos too. My favorite ones are over the top feathers, which is where you do a feather then backtrack across the hump and go into the next one. The best thing to do is to practice drawing feathers on paper. I draw feathers when I’m on the phone or anytime I have a pencil and paper and time to doodle. I’ve never taken a class on them, when I started doing the over the top ones, I used stencils to mark the feather and eventually worked my way to just freehanding them. I have an APQS Ultimate 1 machine.